From pivotal moments in global politics to his time as a StFX student, members of the StFX and Antigonish communities had a tremendous opportunity to glimpse into the life and legacy of the Rt. Hon. Brian Mulroney, Canada’s 18th prime minister, who was on campus Oct. 25 as a special guest at the launch of Dr. Fen Osler Hampson’s book, Master of Persuasion: Brian Mulroney’s Global Legacy. The book by Dr. Hampson, Chancellor’s Professor at Carleton University and Distinguished Fellow and Director of the Global Security and Politics Program at the Centre for International Governance Innovation, is based on unprecedented access—interviews with key players, diaries, memos, etc.—and is the first book to document Mr. Mulroney's impressive foreign policy record, from NAFTA to the collapse of the Soviet Union, climate change to the release of Nelson Mandela. International affairs historian Dr. Hampson is the author/co-author of 12 books on Canadian foreign policy and international affairs and co-editor of 28 volumes. He holds a PhD from Harvard University and is also a graduate of the London School of Economics and Political Science and the University of Toronto. “It is a real honour and privilege to be with you at his wonderful, outstanding university to celebrate the global legacy of the Rt. Hon. 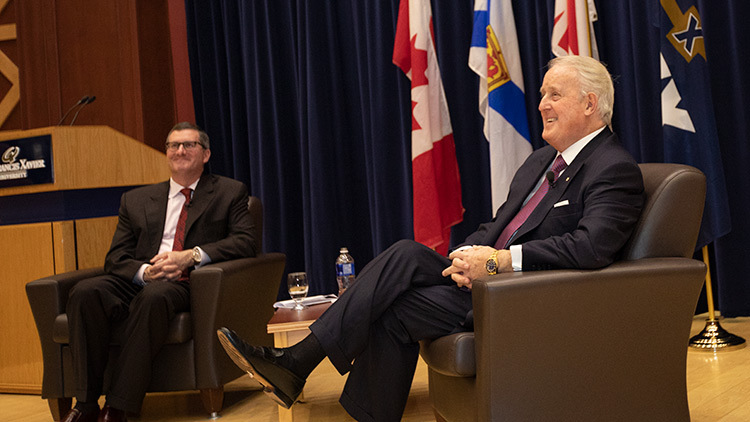 Brian Mulroney,” Dr. Hampson said, opening his presentation at the book launch held before a large crowd of StFX students, faculty and staff, and community members in StFX’s Schwartz Auditorium. “I wrote this book as I’ve been studying Canadian foreign policy for many years. It struck me as I looked at the record, and I began to put the pieces together, how much was achieved in his almost nine years as prime minister. It really is a remarkable legacy,” said Dr. Hampson, who during the evening’s event also participated in a question and answer session with Mr. Mulroney. The book, Dr. Hampson said, is a story about a leader who brought a laser-like focus to his relations working with international leaders and who produced major, measurable, and transformative results during his time in office. Prime Minister Mulroney, he said, had the talent for mobilizing the right people, a leadership style that reached across the political aisle, and he understood what national interest is all about. He was also a team builder, he said, something that requires real leadership. During a fireside chat, which at times drew standing ovations, Mr. Mulroney answered questions, taking the audience back to key moments during his time as prime minister as well as into modern day issues. He gave intimate glimpses into a range of issues from his perspective on the recently signed free trade deal between Canada, the U.S. and Mexico to his take on iconic international leaders with whom he worked. He also touched on how lessons he learned during his time as a StFX student influenced his global politics and foreign policy, including the fight for Nelson Mandela’s liberation. Coady Chair in Social Justice, Sadi Mfalatsane of South Africa, who was in the audience, took the opportunity during the audience question period to sing a song for Mr. Mulroney and thank him “for what you’ve done for us.” She also asked and received his opinion regarding South Africa’s future. StFX political science professor Dr. Lavinia Stan moderated the event, which was hosted by StFX President Dr. Kent MacDonald and Board of Governors Chair Mike Boyd on behalf of the StFX Board of Governors. “We’re brought back in time in terms of the impact a young man had on this country since he left here (StFX) in 1959,” Dr. MacDonald noted. Audience members were gifted with a signed copy of Master of Persuasion.